In this work the problem of measuring on-line the density of green ceramic tiles is approached by using non-contact ultrasonic transducers. The time of flight of the ultrasonic waves is measured in transmission mode using cross-correlation algorithms between emitted and received signals. Once known the times of flight, the propagation velocity through the tile can be estimated, which is proportional to density. The conversion factor between velocity and density is experimentally established through a laboratory calibration. The measurement system was then tested on-line: the results show the effectiveness of this sensors for the relevant industrial application. The problems connected with measurement uncertainty and repeatability are discussed in the paper, in particular concerning the on-line installation. Ceramic tile is one of the most important and ancient materials to cover floors and walls. The world-wide production and consumption of ceramic tiles has increased considerably over the last years (current production is around 2,500 million m2 compared to less than 1,000 million m2 in 1985). With regards to ceramic tile production, Italy and Spain are the first and the second producers, covering about 30% and 15% of the world exports, respectively . The current strategy in the ceramic sector (in particular in the European one) consists in complex product options and strict quality standard production. The quality and durability of the tile depend, therefore, directly and strongly on various aspects (raw materials used, planning and design of the production line, tile production process, installation and maintenance of the tiled surface). Ceramic tile process can be schematically described as follows. The raw materials used for the tile body are a mixture of clay (to provide plasticity), quartz sand (to provide structural strength) and carbonates or feldspars (to provide fluxing actions). They are carefully mixed and ground, in order to obtain a perfectly homogeneous material for pressing. After forming, the tiles must be dried to remove most of the water and then fired (in the case of unglazed tile) or glazed and fired (in the case of the glazed tile). At this point of the production cycle, the tiles are sorted to eliminate defective tiles and separate the higher quality tiles from those of lower quality as well as to divide them into homogeneous groups according to work size and shade. The knowledge of the green tile density is of relevant importance in ceramic production in order to control the pressing process using feedback information. This quantity is actually not measured on-line. Furthermore, it is rarely controlled also off-line, because the most diffuse measurement technique is based on mercury absorption, which could be dangerous for the operator health. From several years the ultrasound analysis is widely used for measurement of material properties, but, notwithstanding its great investigation capabilities, its application for on-line monitoring has been limited by the problems due to the need of contact between the sensor and the measurand. Therefore the introduction of non-contact ultrasound (NCU) sensors offers large potentials and opens new horizons in the field of the on-line quality control, not only in ceramic industry. In the last years, non-contact ultrasonic sensors has been presented in the literature and in the market [2, 3] and they seem to offer the possibility of performing non-contact ultrasound analysis with reduced signal attenuation, i.e. with a limited loss of information. The research reported in this work is devoted to develop a measurement system for the on-line density control of ceramic tiles by non-invasive techniques based on these innovative sensors. To our knowledge, it is the first time that a non-contact ultrasound system is applied for on-line quality control and monitoring. The on-line tests gave preliminary satisfactory results, but some problems still need to be solved. Some of these, as the measurement uncertainty and repeatability are discussed in the paper. The objective of the developed measurement chain is to establish reference density-velocity relationship for green ceramic tile samples and then to determine densities of unknown samples by non-contact ultrasonic analysis. The typical experimental set-up is shown in Figure 1. The system is composed of two sensors, which can operate both as transmitter and as receiver. Therefore the system has two channels for data acquisition (with two amplifiers and two analog I/O boards), in such a way as to present four operation modes (two in reflection mode - one for each of the two sensors - and two in transmission mode - one used as transmitter and the other as receiver and vice-versa). Fig 1: Scheme of the measurement system (T: transducer, R: receiver). Fig 2: Typical chirp signal (amplitude in arbitrary unit). Bandwidth around the central frequency: 560 kHz. Chirp Duration: 350 m s.
In the performed tests the system operated in direct transmission mode, i.e. ultrasound travels from the transmitting to the receiving transducer through ambient air and the sample. In order to measure the time of flights, a cross-correlation  algorithm is employed, which allows to determine the delays between emitted and received waves. In the first step the system has to be calibrated without the sample between the transducers. In this operation, one fixed the ultrasound velocity in air (Va) (which is a function mainly of the ambient temperature and is determined through experimental measurements), it is possible to estimate the distance between the transducers (D), once measured the time of flight in air (ta). When the sample is in the measurement position, the system can measure the time of flight with the sample between the transducers (tc< ta) and the time of flight through the sample (tm). A typical result is reported in Figure 3, where the cross-correlation signal measured in optimal laboratory conditions on a calibration sample is shown: (tc) is represented by the first peak, while the delta T offset between first and second peaks is equal to 2(tm), see Figure 1.
which should be related to the density through experimental coefficients achieved by calibration. As previously shown, in order to obtain the density values of the test material, it is necessary to start from the ultrasound velocity through the material. In order to find a relation between velocity and density, a dedicated calibration must be performed using references samples of unfired ceramic tiles, whose density was previously determined by mercury absorption method. the irregular shape of the surface makes part of the energy to be dispersed in shear waves propagating in the structure. Using smooth samples it is thus possible to obtain more accurate measures without a relevant dependence from the position of the measurement point. A typical example of results achieved in these tests is reported in Figure 4. Fig 4: Example of a signal measured in transmission mode on the ceramic tile (amplitude in arbitrary unit). The reference samples used for calibration are 20, more exactly they are 5 for each density value (1.91 g/cm3, 1.96 g/cm3, 2.01 g/cm3, 2.06 g/cm3) in the range of interest for green ceramic tiles. The propagation velocity was measured in one point of each sample, by averaging on 200 readings. Then, the mean velocity value for each density level was calculated, in such a way as to obtain only one velocity value for each known density value. This one is an important step, as it aims to take into account also the dispersions in the results due to the uncertainties in the reference samples, which are surely significant. In fact, the density is a "local" quantity, that can easily present small variations from point to point of the same sample, whose density is therefore only "nominally" known. The results were plotted and linearly interpolated, as shown in Figure 5. The straight line results the best interpolation curve in accordance with a known linear dependence between velocity and density in ceramic materials. This calibration line is used to determine the density value of unknown samples. Fig 5: Reference density-velocity relationship of green ceramic tiles. The standard deviation (Sd) of the estimated density for a given velocity reading can be statistically evaluated , in order to quantify the random uncertainty introduced by this velocity-density conversion. In this case it was found that ± 3*Sd = ± 0.02 g/cm3, which can be considered as a satisfactory value. "Smooth" tiles: velocity 10 m/s (about 0.8 %), density 0,01 g/cm3 (about 0.5 %). Tiles with embossed grid: velocity 20 m/s (about 1.6 %), density 0,02g/cm3 (about 1 %). All these measurements were performed under controlled laboratory conditions. Once the conversion factor between density and velocity is established, the system was tested on line to measure the density of the green tiles at the exit of the drier (Figure 6, installation at the factory of Leonardo Ceramica 1502). In theory, the control of the density should be performed before the drier (i.e. immediately after pressing), but the high moisture content before drying (1-3 %) induces a too strong signal attenuation, making the reading of the velocity almost impossible. However, after the drier the material is still recoverable and therefore the feed-back control can be efficiently realised. Fig 6: On-line installation of the non-contact ultrasonic sensor. The data are exported through the serial port and acquired and processed using a software developed in LabView environment. The results are shown in Figure 7, where the density values measured on the green tiles at the exit of the drier are reported: it is worth noting how the signal amplitude decreases when no tile is passing between the transducers, while it is almost constant when each tile is passing. Fig 7: Density values measured on-line on the green tiles at the exit of the drier. These results demonstrate the feasibility of the on-line control by non-contact ultrasonic technique. Furthermore, it seems that also the profile of the density along the tile can be extracted. In this case, each reading corresponds to the result of averaging 50 measurements, taken while the tile is passing. Therefore, each density value is the mean value relative to a line profile with a length of about 6-7 cm (20-25 % of the tile length, which is 32 cm). From the analysis of the on-line results it is possible to state that, with the actual sensor installation, the repeatability of the results decreases with respect to the laboratory tests. In particular, in the worst conditions it is 150 m/s (about 12.5 %) for velocity and 0.05 g/cm3 (about 2.5 %) for density. Further tests are thus required in the near future in order to fix these issues, in such a way as to consider the NCU approach as fully suitable for on-line monitoring of green tile density. In particular, it will be important to protect the system in a dedicated cabin to be positioned on the line and to synchronise the acquisition with an external trigger. In this work non-contact ultrasonic sensors have been applied for the development of a non-intrusive on-line control system of bulk density in green ceramic tiles. The measurement system was firstly calibrated in laboratory conditions and then installed and tested on the line. The results seem to be promising: the density of the each tile passing on the line can be measured with a repeatability of about 0.03-0.05 g/cm3. Dedicated installation will be realised in the future with the aim of minimising the effect of the disturbances typical of the on-line installation (vibration, dust, temperature, electro-magnetic fields, etc.). Several other industrial fields may benefit from the application of this sensor, as the production of food or paper and the structural diagnostic investigation. The authors wish to acknowledge: the company Leonardo Ceramica 1502 for the availability in preparing the reference samples and in performing the on-line tests; the company Gres de Nules for the availability in preparing the reference samples with and without the embossed grid; Dr. Valerio Sarnelli, for the important contributions given in the development of the research. Finally, the authors acknowledge also the support by BRITE-EURAM Project No.96.3632, and that of their partners in the project. J. R. Hernandez, "A Dynamic Comparative Study of the Ceramic Industry", Science and Supercomputing at CINECA - 1995 report, Eds. Giovanni Erbacci and Marco Voli, Bologna, Italy, pp. 624-626, 1995. M.C. Bhardwaj, "Innovation in non-contact ultrasonic analysis: applications for hidden objects detection", Mat. Res. Innovat., 1: 188-196, 1997. M.C. 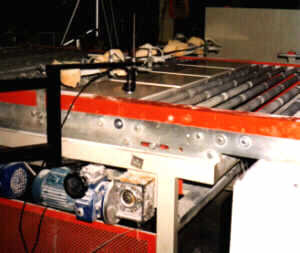 Bhardwaj, "Non-contact ultrasonic characterisation of ceramic and composites", Symposium on NDE of Ceramics, 99th Meeting of American Ceramic Society, Cincinnati, OH, May 1998. J.S. Bendat, A.G. Piersol, "Random Data: analysis and measurement procedures", John Wiley & Sons, Inc., 1986. E. Doeblin, "Measurement systems: application and design", McGraw-Hill International Editions, 1990.